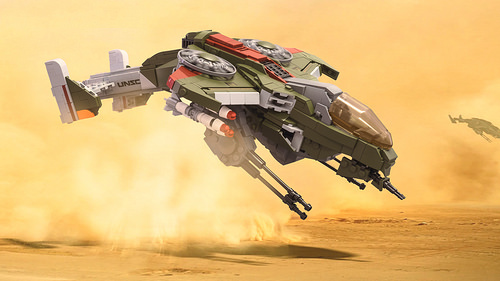 Another construction toy brand might have the Halo license, but that doesn’t stop LEGO fans from building characters, vehicles, and locations inspired by the venerable Xbox series from Bungie and Microsoft. Check out Pelicans, Warthogs, the Master Chief, and more LEGO Halo weapons than you can shake your armored fist at right here on The Brothers Brick. 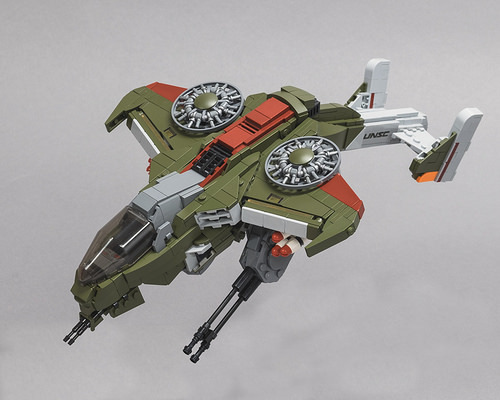 Video games are a great source of inspiration when it comes to building LEGO spaceships, especially the Halo franchise, with a wide variety of orbital, deep space, atmosphere, and ground vehicles from many space-faring species. 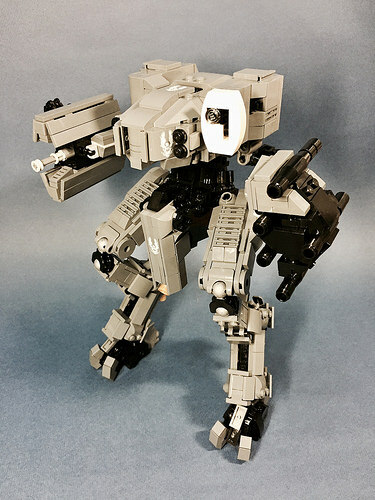 Marius Herrmann, who has built models from Titanfall 2 and Horizon: Zero Dawn has built a stunning version of the AV-22 Sparrowhawk from Halo Wars. While this might look like a digital render to some, the source for many of the unusual olive green elements is much more analog. The builder used a very careful application of spray paint to produce the needed parts for this wonderfully detailed craft, and the results speak for themselves, if you ask me. On the more traditional side of things, I especially like the propellers, made from a lattice radar dish plus mini-fig hands and hooks. Here is even an added bonus, a depiction of the craft in action. I grew up playing lots of first-person shooter games. Even with great shooters in recent memory like Titanfall, Rainbow Six: Siege, and Overwatch, my favorite remains the Halo series. There’s nothing too complex about classic Halo multiplayer, which I have always appreciated. 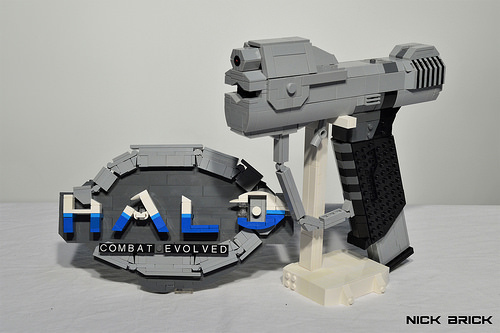 To show my fandom of one of my favorite games, I present a LEGO replica of the M6D Magnum from the original Halo: Combat Evolved from 2001. 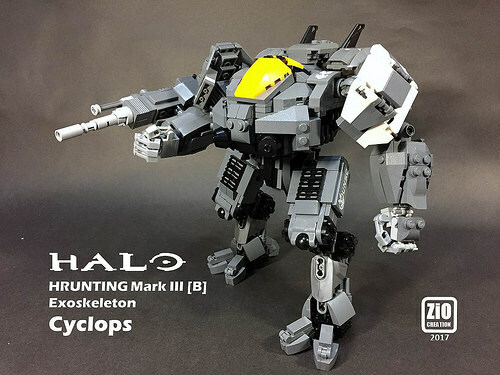 The “Cyclops” mech appears in the Halo Wars real-time strategy games, reproduced in excellent LEGO form by ZiO Chao. While it may appear rather tiny in the game, seeing it at minifig-scale helps emphasize what a big stompy thing it really is. With an overall dark gray or olive-drab color scheme like most UNSC vehicles, I particularly like the pop of color from the yellow cockpit canopy. 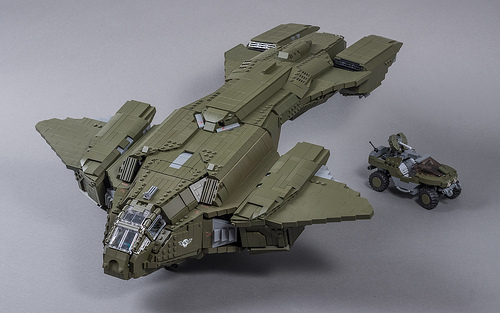 ZiO’s build features custom-printed tiles for the UNSC logo and other details, and it’s fully poseable. Armed with a massive cannon on its arm, the Covenant better beware! Marius Herrmann built the Pelican dropship from Halo 3 based on the design by Ben Caulkins. What takes the model to another level of novelty are the spray-painted bricks that were used to build it. Whether you condone or cringe at altered parts, it’s hard to deny that the end result looks superb and fit for a true Spartan. YouTuber Nico71 presents a LEGO Technic model of the iconic Warthog light recon vehicle from the Halo games. With working quad-wheel steering, RC controlled driving, rotating machine gun turret barrels, and suspension, his Hog truly is beauty and the beast. Watch these and many more impressive functions in the video below. Nico’s Warthog is discussed in detail, with building instructions, on his blog. TRLegosfan shows some love for Halo 4 with a colorful diorama depicting the inner surface of the Shield World of Requiem. The aesthetic of the Forerunner world – tall, angular structures upon artificial landscape overgrown with alien vegetation – is shown beautifully in the bricks. Introduced to the Halo universe in Halo 4, the Mantis shook up the vehicle gameplay with a mech carrying immense firepower and capacity for celebratory crouching. 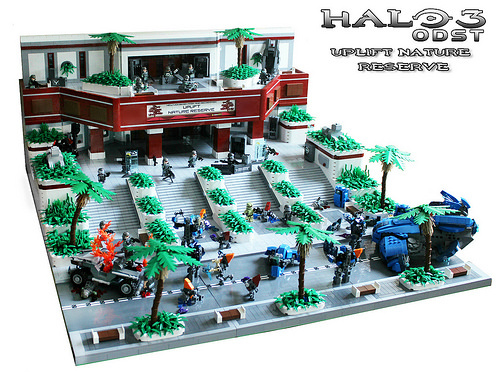 ZiO Chao presents a LEGO version of this UNSC powerhouse in incredible detail. His accurate model is fully poseable, with flexible legs, cockpit, and armaments. 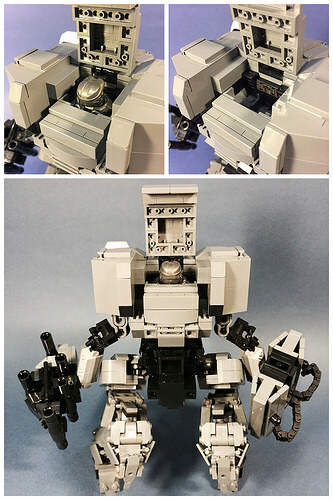 The minifigure-scaled mech comfortably seats a Spartan minifigure at the controls. See more photos, including some progress shots, on ZiO Chao’s Flickr. Today marks the fifteenth anniversary of both Halo: Combat Evolved and Microsoft’s Xbox console. Halo has had a massive impact on console first person shooters, game storytelling, multiplayer, and sales of the Xbox, but today we’re looking at another aspect of Halo’s influence. We’ve rounded up a small selection of the amazing builds the adventures of Master Chief has inspired LEGO fans to create. 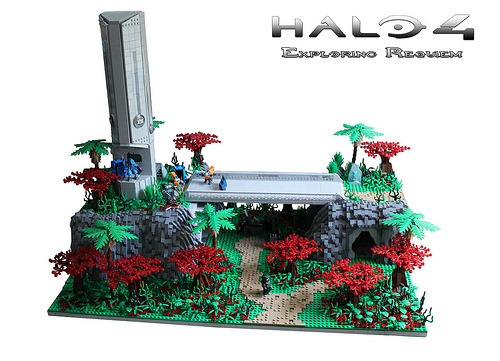 Pause your sixteen player LAN game on Blood Gulch and explore some of the best of LEGO Halo. 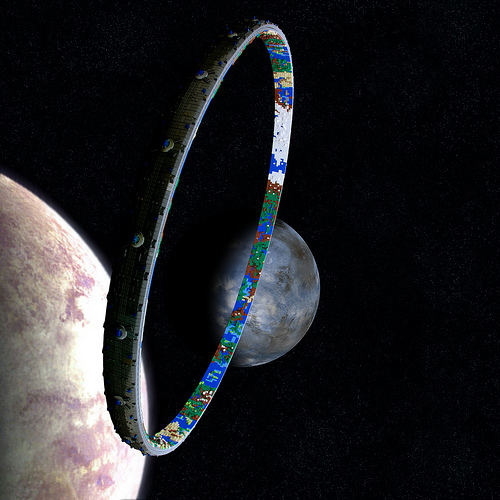 First up is Catsy [CC] with his microscale model of the ringworld itself, spanning nearly 5 feet across. 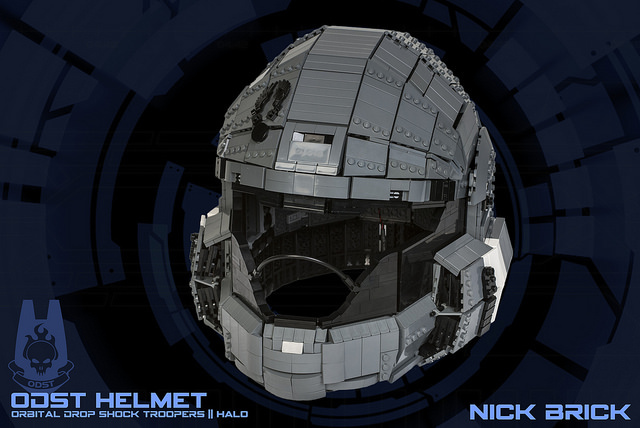 Ever since I had the chance at Brickworld Chicago 2011 to wear my good friend Ben’s LEGO Master Chief helmet, I wanted to construct a helmet myself. It was far more difficult to build than I expected, and was nothing like building other 1:1 scale builds. I’ve attempted this project before – first time in late 2011, and second in mid 2015, both failing. Finally, in 2016, I found a frame solution that worked well, and now I can present a wearable LEGO ODST helmet from the Halo series. Sean Cassidy induces nostalgia for the often overlooked Halo 3: ODST with his diorama of the final stand at the entrance to Uplift Nature Reserve, New Mombasa. Having fought many campaign playthroughs and firefights on this particular area, it seems Sean’s layout is near perfect. His choice of colors and techniques for the entrance, overlook, and planters fit the New Mombasa style of a believable yet futuristic city. There are all kinds of vignettes within the overall massive diorama to find, shown on Sean’s Flickr. My favorite is the face-off between gravity hammer wielding Brute Chieftain and rocket launcher wielding ODST. Yes, that much firepower is necessary against a Chieftain. While the Halo license for building bricks is, unfortunately, in the hands of Mega Bloks at the moment, that doesn’t mean that Halo and LEGO fans haven’t been building iconic creations from the series in the superior brand. Proving that point today is Velocites with the HRUNTING/YGGDRASIL Mark IX Armor Defense System… or UNSC Mantis to save time. While it uses only official pieces (save for the bullet chain), this isn’t a purist build as the military olive colour here is done with paint. In the interest of comparison, here is the Mega Bloks Mantis. For a $33 set, we must admit that Mega Bloks actually did a good job, but this LEGO version blows it out of the water. I may be a bit biased here, considering 1) Halo 3 is my all time favorite video game, and 2) these two vehicles are my top favorites in the series, but these vehicles by BrickTechStudios are pretty darn good builds. First up, the Hornet — a single pilot VTOL. Olive green is a great choice, perhaps the most accurate fit to the green of most human vehicles in Halo 3. This color is limited in parts selection currently, but looks like it wasn’t an issue here! 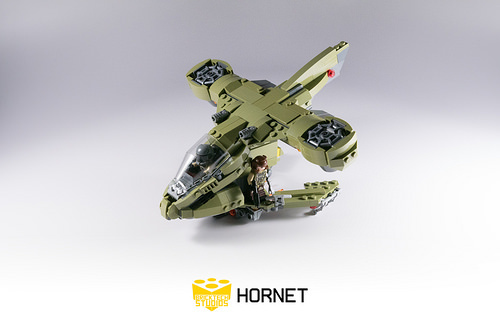 Great parts choice all around make this Hornet instantly recognizable by any Halo fan. 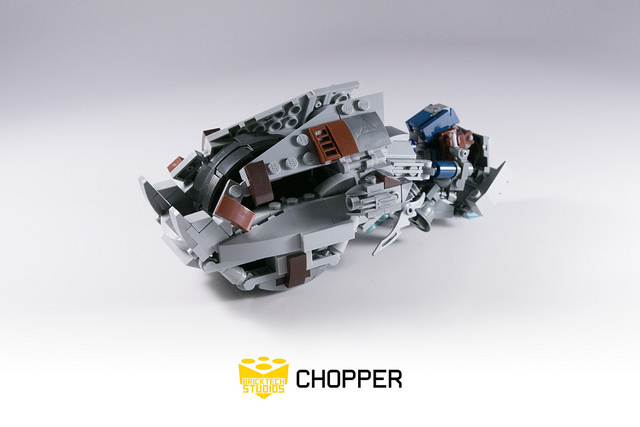 Next we have the Brute Chopper. All Halo vehicles can run over players on foot, but the Chopper can also run over other vehicles! The Chopper, and the Brute aesthetic in general, is comprised of metal plating, taped/strapped components, and oversized blades. The builder uses light gray, brown, and flat silver pieces to distinguish each of these design elements. I like the prominence of the vehicle-shredding tusks in front. 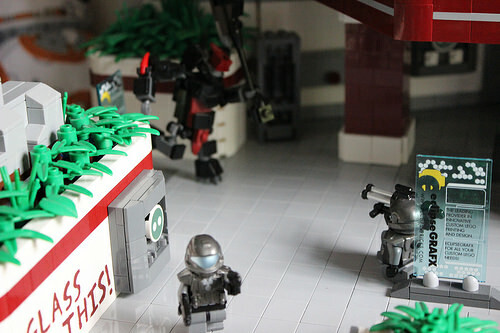 See more LEGO Halo on BrickTechStudios’s Flickr.